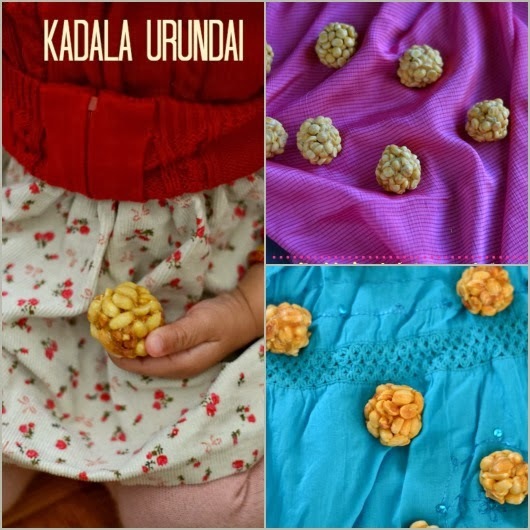 For this week of Blogging Marathon #36,I will be sharing Travel food recipes and today's recipe is a evergreen snack kadala Urundai and Pottukadalai Urundai.This snack doesn't need of any introduction and its a favorite for both adults and kids. Growing up we used to travel a lot with relatives and friends.As my father loves to travel a lot, he organised at least 2 or 3 trips for couple of days in a year. 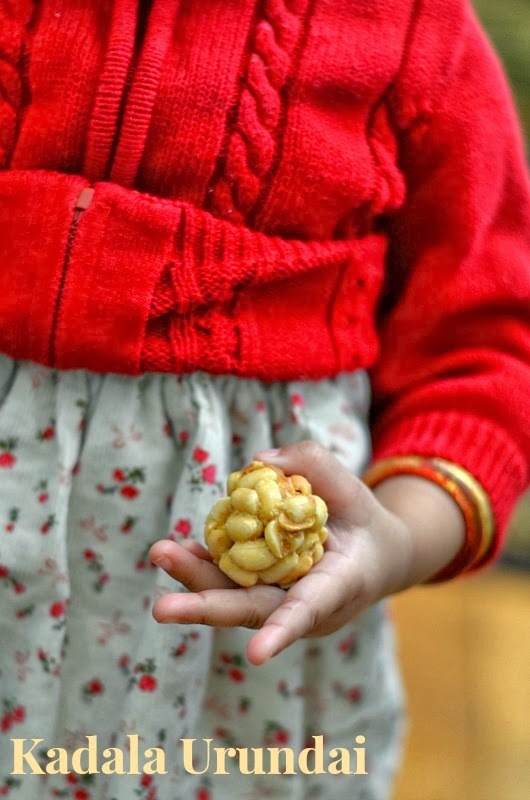 The first day food used to be the homemade one along with a variety of homemade snacks such as karasev,murukku, spicy mixture and store bought kadalamittai(peanut chikki). But after coming to U.S,the peanut brittle which is available in Indian stores are not tasted as good as the one we get it in our place.So I tried to make at home and it was a flop all the time,once the jaggery syrup spilled on my hand and had a severe burn.Then stopped experimenting at home,but after seeing this one in a T.V show in a microwave oven I immediately wanted to try.The result was a great success,since then I make it with microwave oven. Take a microwave safe plate and spread the peanuts and keep it in a microwave high for 3-5 minutes or till it becomes roasted.In between take it and check its roasted properly or not.Once it becomes warm,crush the peanuts between the palms and remove the skin. 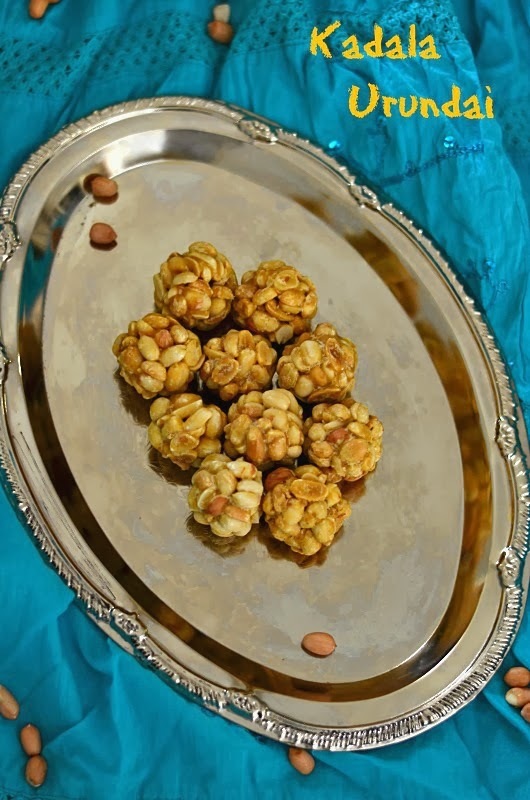 In a glass bowl(preferably glass) add the jaggery and water and keep it in the microwave for 2 minutes till it melts.Pass it through the strainer and transfer it to the glass bowl and keep it in the microwave for 3-4 minutes. Take it out and check the consistency and keep it for a minute.Check the consistency now and then till it reaches a soft ball consistency.To check the consistency,take water in a bowl and pour a drop of syrup,if a solid ball is formed then its the correct consistency.Now drop the peanuts to the syrup and mix it well and keep it in the microwave for 15-30 seconds. Remove the bowl and let it cool down slightly.Now grease the palm with ghee and make ball out of it. Arrange it on a plate. While making the ball if its too hot,then you can wet the hands in water and make it. Make a rough ball when its hot and make a smooth shape after it reaches the bearable temperature. When the sugar syrup is above to reach the consistency check it every 30 seconds otherwise you cannot achieve the consistency. 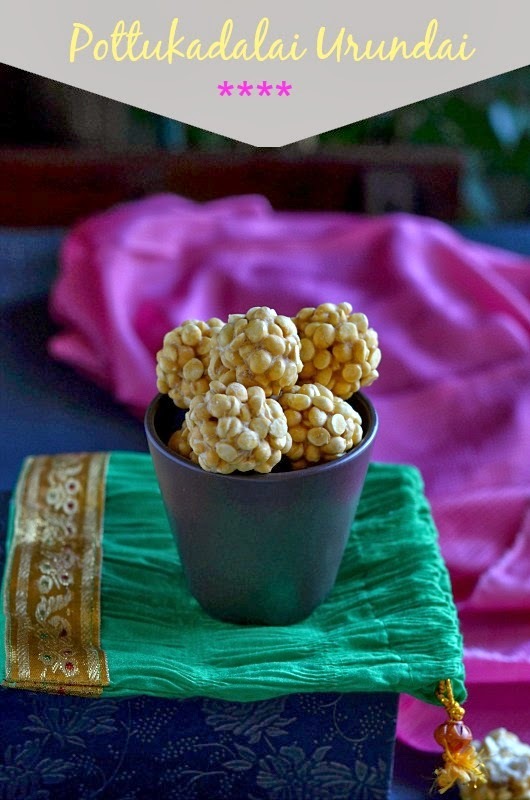 For the pottukadalai urundai use 11/4 cups of roasted gram dhal for the 1/2 cup of jaggery. Cardamom powder can be added for extra flavor. Use a slightly bigger glass bowl for the jaggery syrup as chances are there to spill while cooking. Check out my fellow bloggers participating in Blogging Marathon #36. This recipe is off to Cook Book Challenge #4 January week 4. 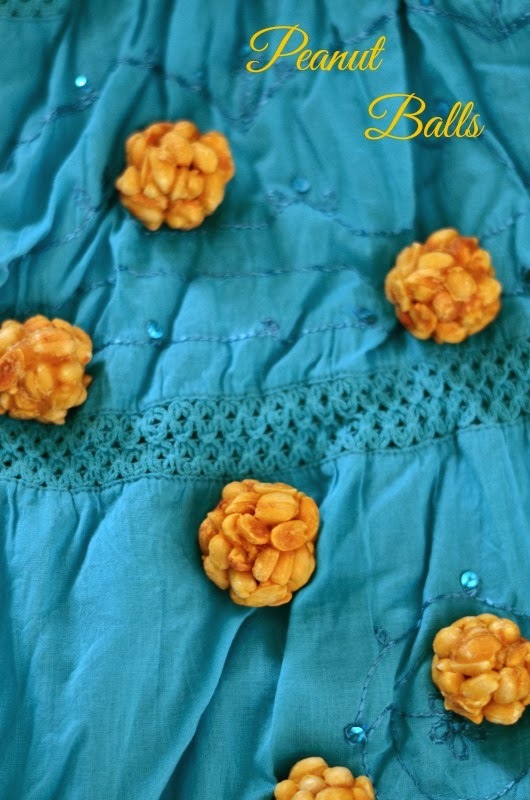 I love all the clicks so beautifully styled dear :) awesome and perfect snack. 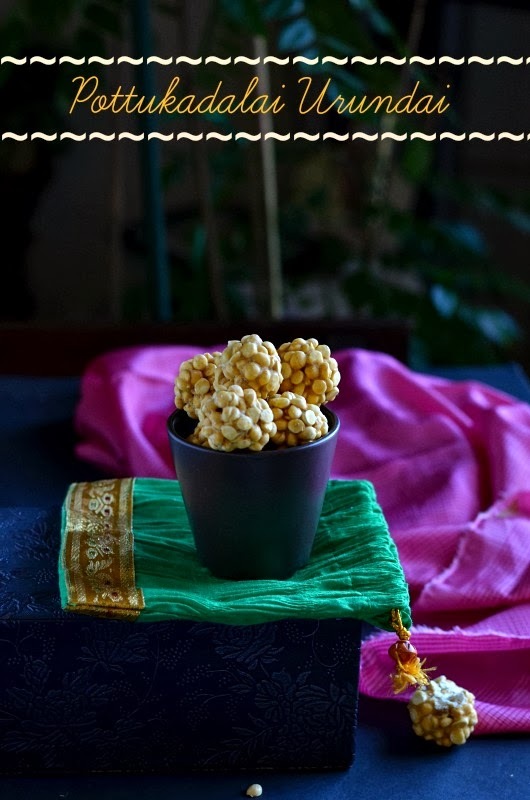 Wonderful clicks dear and perfectly made those toothsome laddoos. Wow these are microwaved? Love them will try them soon an let you know the result. 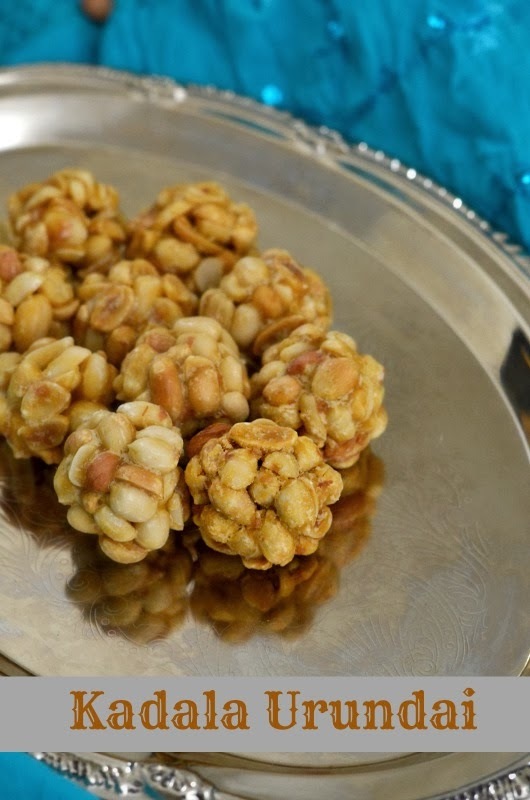 Peanut laddoo in the microwave sounds so easy and convenient. Will have to try these soon. Clicks with your little model are sooo cute. I am just blown away by how amazing your photos look. I would think you were a professional photographer. You should give us some tips!